How can I get nVidia CUDA or OpenCL working on a laptop with nVidia discrete card/Intel Integrated Graphics? Background: I'm a 3D artist (as a hobby) and have recently started using Ubuntu 12.04 LTS as a dual-boot with Windows 7. It's running on my a fairly new 64-bit Toshiba laptop with an nVidia GeForce GT 540M GPU (graphics card). It also, however has Intel Integrated Graphics (which I suspect Ubuntu's been using). So, when I render my 3D scenes to images on Windows, I am able to choose between using my CPU or my nVidia GPU (faster). From the 3D application, I can set the GPU to use either CUDA or OpenCL. 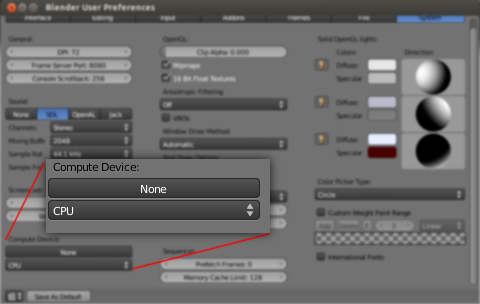 In Ubuntu, there's no GPU option. After doing (too much?) research on the issues with Linux and the nVidia Optimus technology, I am slightly more enlightened, but a lot more confused. I don't care one bit about the Optimus technology, as battery life is not by any means an issue for me. Here's my question: What can I do to be able to use CUDA-utilizing programs (such as Blender) on my nVidia GPU in Ubuntu? Will I need nVidia drivers? (I have heard they don't play nicely with Optimus setups on Linux.) Is there at least a way to use OpenCL on my GPU in Ubuntu? ERROR: Support for necessary OpenGL extensions missing. When running a CUDA program, you need to install the CUDA toolkit and a nvidia driver. If you intend to compile programs, you also need the SDK. The installers can be found on http://developer.nvidia.com/cuda-downloads, please read the below instructions before borking your Optimus laptop. I recommend to install the nvidia driver from Ubuntu's package manager. If you install Bumblebee, you don't need to worry about the driver. Otherwise, after installation, disable the nvidia libraries as described on https://askubuntu.com/a/107746/6969. If you do not do so, you'll loose 3D acceleraration and possibly get stuck on a low resolution. You may skip this step if you want, but then you've to set LD_LIBRARY_PATH=/usr/local/cuda/lib64:/usr/local/cuda/lib:$LD_LIBRARY_PATH later when running a program. a few (5) lines further, do the same, but remove -lcuda too. a few (7) lines further, do the same as you did in line 271. (you can strip the 32-bit paths from it if your program is 64-bit). It is indeed possible to get nVidia Optimus GPUs to run CUDA on Ubuntu. If you need to use a graphics-intensive program such as Blender, Bumblebee is currently a good way to go. Skip to Installing CUDA if you don't want to install Bumblebee (i.e. if you don't need OpenGL). Follow the instructions at How well do laptops with Nvidia Optimus work? These are currently kept up-to-date by a Bumblebee developer. Once you've installed Bumblebee and rebooted, you will be able to choose the graphics card to use when launching programs by using the optirun program. You'll see a program with colorful spinning spheres if all's working correctly. Verify that the GL vendor string in the terminal contains the word nvidia. If you run only glxspheres, you'll see the vendor string contains the Intel card instead. I recommend to install the nvidia driver from Ubuntu's package manager. If you install Bumblebee, you don't need to worry about the driver. Otherwise, after installation, disable the nvidia libraries as described on https://askubuntu.com/a/107746/6969. If you don't, you'll lose 3D acceleration and possibly get stuck on a low resolution. You may skip this step if you want, but then you have to set LD_LIBRARY_PATH=/usr/local/cuda/lib64:/usr/local/cuda/lib:$LD_LIBRARY_PATH later when running a program. If you want to be able to compile CUDA applications, you can install the SDK in a similar way as described above. Download, make it executable and run it (not as root, e.g. without sudo!). If you want to use Blender's GPU rendering feature, you may need a Blender build with pre-compiled CUDA kernels. Builds from Blender.org all have pre-compiled CUDA kernels; the ppa:cheleb/blender-svn builds (more information at this question) do not. To install an official Blender build, simply follow the instructions laid out in this answer. Hybrid graphics (usually Intel integrated graphics and Nvidia discrete graphics) support under Linux is currently a bit troublesome. Something is slowly moving in the X server field but don't hold your breath. As you have guessed Bumblebee is currently a good way to go. I recently bought an Asus N55 laptop with Intel/Nvidia graphics I was able to get the Blender Cycles renderer to use CUDA. When I installed Ubuntu 12.04 it used the integrated graphics by default trough the intel graphics driver. The noveau graphics driver should not get installed. I find that to run all the examples of CUDA, using Bumblebee, you have to install the drivers 295.40 from here and during installation choose not to override the config x11. Then you have to use the same driver to compile the examples and to run the program. Not the answer you're looking for? Browse other questions tagged nvidia bumblebee cuda opencl or ask your own question. Is there a PPA for the latest Blender version? Will installing CUDA for my Nvidia card make OpenCL available? How to get Nvidia 555M working on Ubuntu 12.10 (drivers, optimus, cuda)? How do I make the nVidia graphics card the default? How to use Nouveau for graphics and NVIDIA GPU for only CUDA programs on Optimus notebook?